Surprise Party! | are you my moms? The smile you see to your left is the signal that my little digital ovulation predictor kit detected a surge in lh (luteinizing hormone). This means the follicles doc saw on my pre-treatment ultrasound have received the right amount of estrogen to make them grow (with a little help from the letrozole). The high estrogen levels have prompted production of lh, the hormone that makes the follicles leave the ovaries. So when the test detects the surge in lh, I’ll ovulate within the next 24 hours or so. That’s right, folks. I read the books. And the instructions on the ClearBlue Easy box. When I say the smile appeared “against all odds,” I’m not just being dramatic. Today is only cycle day 9, and we were supposed to trigger my ovulation with profasi in two days. The guru only told me to start using the tests on day 8 as a precaution. No one, including doc or the guru, thought we’d actually get a positive until after the profasi did its job. 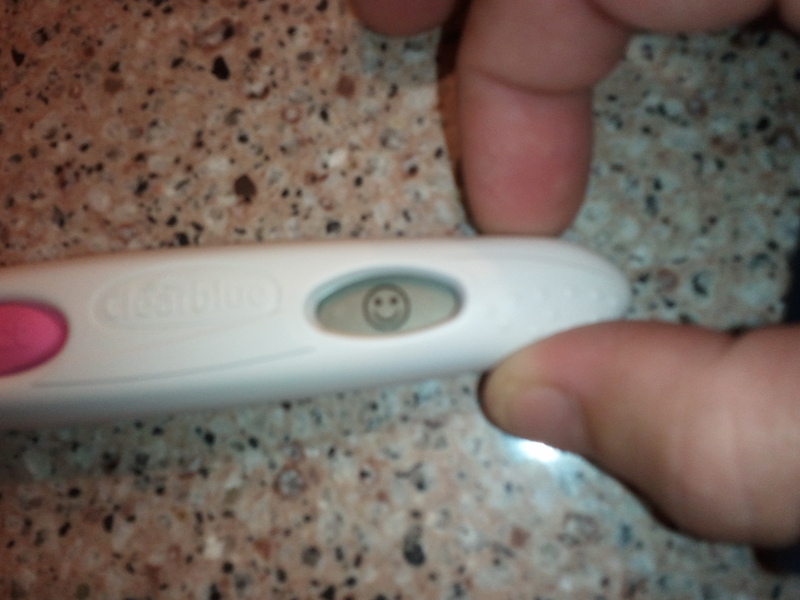 I’ve been using these “smiley sticks” for 4 months now, and I’ve only ever had a non-medically-induced smiley face once. It was on or around day 9 last cycle. I was so excited. In the months leading up to that cycle I’d not started testing until day 10, thinking that since most women ovulate around day 14, I’d have plenty of buffer. We sent frantic texts to the guru and went to doc’s office, a ball of excitement and nerves. I called my mom, my boss, my bff, the Publix deli lady, my 4th grade teacher, and the girl at the hair salon who always gets my appointment times wrong. We were having a baby, dammit!! The world needed to know!! Nope. It only took 15 minutes and a cup of urine for doc to tell us that it was likely a false positive. The follicles weren’t the right size yet. We parted ways for work that day, disappointed, but still on track for our scheduled treatment a few days later. So when I got the smile again this morning (on day 9!) we were sure it was a repeated exercise in futility. In the dark of the early morning, I fumbled through my baby file and found my appointment card: “Call or text guru 7am/7pm with positive opk on or before cd 11.” Right. Relax and enjoy, I thought, as I typed a quick message to the guru. It’s just going to be an ultrasound, and then you’re back to your normal, quiet Saturday with no plans. “Doc will meet u @ her ofc 930. If follies mature she will insem.” I woke MKL up and gave her the news, and packed up our insemination good luck charms and the pillows I’d stack under my legs for the 20-minute ride home…we wouldn’t need them, but just in case. We were both thinking about the money we’d potentially waste on a needless ultrasound, but the alternative is that we’d potentially miss our window. Even from a purely financial standpoint there’s no question about whether or not to go for the test; we’re better off wasting an ultrasound than a vial of sperm. I’m starting to think they make that crap out of platinum. Based on her expression when she greeted us in the exam room wearing workout gear, I’m pretty sure doc shared our doubt about the chances of that smile having occurred naturally. But that’s precisely what happened. The ultrasound showed that the already noted follicle in my right ovary was big and ready to go. The next few minutes passed in a blink. Before I knew it we were signing consent forms and confirming the donor number from the frozen vial. Doc shot me up with profasi, to be sure that giant follicle pops out of the ovary on time, while the guru’s weekend assistant thawed the sperm. 30 minutes later I was stacking my pillows in the back seat of our car. Yesterday was MKL’s bday. A friend asked her earlier this week what she wanted for her birthday; she half- jokingly replied, “a baby.” We have beautiful, caring friends who would do anything to make our wishes come true, as we would theirs. So it didn’t surprise me last night when MKL opened her birthday gift to find a baby doll – their attempt to give her exactly what she wished for. The doll joined a hand-made-with-love good luck card in our bag and accompanied us to doc’s office. I’m not sure if it was the good luck charms, the past few days’ lull in babymaking activity, the chinese herbs prescribed by my acupuncturist, or just the whole unexpected nature of the day’s activities, but we were calm and relaxed throughout the entire experience. If it’s possible to enjoy a procedure like iui, I think we did today. The next step is another appointment tomorrow, where we’ll determine when we’re going to do iui #2 for this round…might be tomorrow, or she might postpone. Remaining in our relax-and-enjoy state of zen during the two week wait might be a chore. But for now, we’re good. Who knows? Maybe MKL will get her birthday wish after all.